There are 2 types of Custom Reports in Dragon Metrics - Scheduled and One Time. As their names suggest the scheduled report will be sending you new reports in a routine basis, whilst one time report will only give you a single report. This article will discuss how they works and their differences. On the Scheduled Reports tab, you’ll see two types of reports – Masters and Snapshots. Let’s go into a little detail on the difference between these two. Report templates are set up as “Masters”. Create a master with relative date (e.g. “Most Recent 30 Days”) and choose an update schedule. 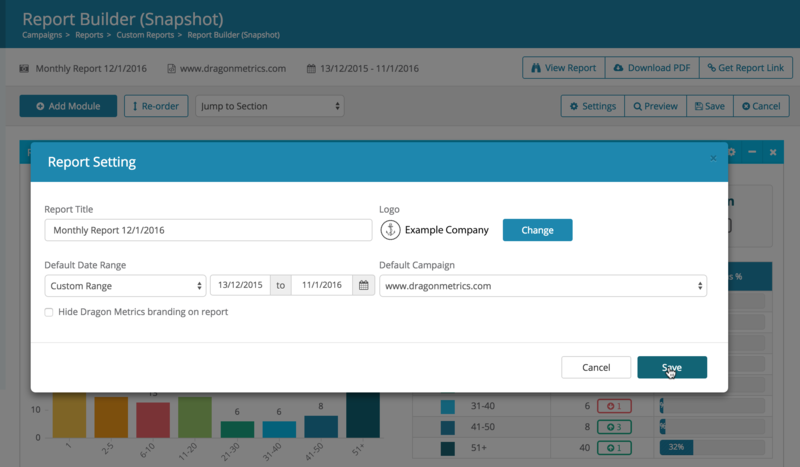 Then at this interval (daily, weekly, or monthly), Dragon Metrics will create a new “Snapshot” report and send an email notification to you and anyone else you’ve included. These Snapshot reports will look exactly like the master report, but with an updated absolute date range (e.g. “January 1st, 2016 – January 31st, 2016”). 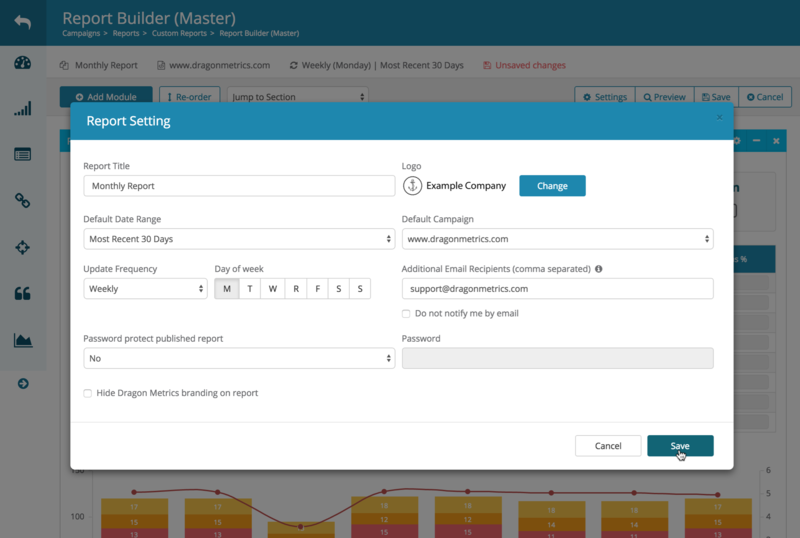 Snapshots are fully independent of Master reports, which means you can customize each Snapshot adding analysis, external data, changing modules, fine-tuning date ranges, or more, all without affecting any other Snapshot in the series. If you need to make a change to all future reports, you can go back and edit the Master, and the changes will take effect for all new Snapshots. Snapshots work almost exactly like One-Time reports do currently, but they are not created directly — they’re created from a Master you’ve already set up. They can be created on the schedule you set, or you can always create a new Snapshot at any time manually. Similarly, since Master reports use dynamic date ranges, their data is constantly changing. Therefore, there’s no way to share a URL to the Master report or download a PDF. You’ll need to create a Snapshot first, whose data is locked until you manually edit it. Cannot be created directly. Must be generated from a Master. Another great feature about the scheduled reports is that all Snapshots with the same Master are linked together. That means that past reports are easily accessible — just choose any report from the dropdown at the top of the page. Master reports can be deleted by checking the box next to the report, and clicking the delete button. However, doing so also removes all Snapshots associated with the Master. There may be times in which you want to keep all your existing Snapshots, but don’t need to keep generating new ones. To do this, we can archive a Master. When you archive a report, it will be moved from the “Scheduled Report” tab to the “Archived Reports” tab. All Snapshot live report URLs will stay active, but you will not be able to edit the Master or Snapshots. No new Snapshots will be generated. If you change your mind, to reverse the process, just select the report again, and click “Un-Archive”. There may be times in which you may want to create a simple one-off report. These reports will not automatically update on a schedule. Whenever you want to create a one-time report, you can click on the One-Time Reports tab and create report by clicking the + icon button.